We're temporarily suspending our BOINC feeder while we deploy new versions of all our applications. It shouldn't take more than a couple of hours. I'll keep you posted. Message 3205 - Posted: 25 Jun 2014, 15:17:58 UTC - in response to Message 3204. Is there something huge on the way??? Or is it because pypy 2.3.1 can handle with python? Aurel, I'll have more information available tomorrow. For right now, I think I have things working to continue crunching throughout the night, but please report any problems you're experiencing in the meantime. So far I've fixed one bug related to the download link (for applications and input files) and another related to a path issue for the CCL app (the actual error results in a "File Not Found"). Message 3223 - Posted: 28 Jun 2014, 22:39:29 UTC - in response to Message 3213. I do not know which of the above issues I was experiencing before but previously out of 7 Linux 64bit 4 processor machines I have, I had one Linux 64bit box that would not run MindMolding. I am happy to report that all of the boxen are now able to run it. Message 3224 - Posted: 28 Jun 2014, 23:23:50 UTC - in response to Message 3223. I have seen some rather strange behaviour in a few of the WU's. the 11 listed below I had on 1 of the computers and I noticed that after around 50 min. they still showed 0% progress so I aborted them. I notced when checking the stats / my computers that they were all assigned to other machines I have running. I check them on the other computers and they were having the same behaviour 0% progress after very long run times. At the time of writing this some of them have completed some are still running the ones that have completed have very long run times 4x longer than normal and when they do complete they say 0% progress. I am however receiving appropriate credit for them for the amount of run time. But it seems there may be a bug of some kind since they have very long run times and show no progress in boinc manager. If they had not been assigned to several different computers of my own both Opteron and Xeon rigs I would not have noticed this, but since I did I figured I should report it. Message 3235 - Posted: 8 Jul 2014, 13:46:24 UTC - in response to Message 3224. 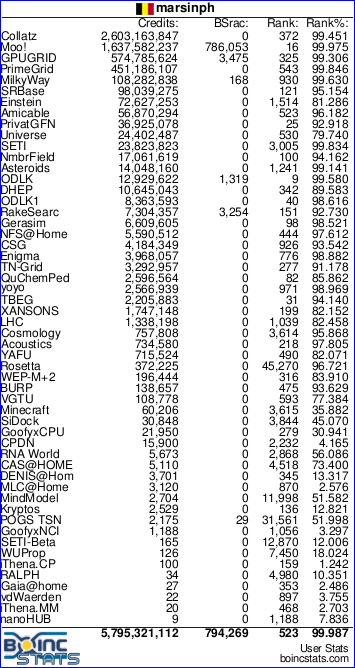 Our models are generated from many different researchers across many different projects, so runtimes can vary drastically between projects, jobs, and even individual work units (due to stochasticity inherent in the models). Furthermore, our project specializes in parallel parameter evaluations of cognitive models, meaning we run many simulations under varying conditions. We checkpoint workunits at the simulation level, and target workunits to take about an hour. If a single simulation takes 30-45 minutes, then we will run only one simulation per workunit. Unfortunately, in this case it means there will be no checkpointing, and no visible progress, until the workunit completes. Workunits would jump from 0% to 100% complete when the first simulation completes. Our ideal and most efficient models take a couple minutes to run a single simulation. We then bundle enough of these simulations in one workunit to equal about an hour of runtime (to minimize bandwidth and overhead). Let me know if that helps clarifies things. Any word on when work will be restarted? Travis, there has been work available for a few days now, for all platforms. Just allow work for your computers and you should get some. Check the main page and it shows that there is a lot of work currently available. Message 3324 - Posted: 30 Nov 2014, 17:20:04 UTC - in response to Message 3319. There is no more work available.. is there a database issue? It's been like this for 2 days. Hopefully in the meantime you can create Windows versions of a few more of your applications. I'd love to be able to donate my processor time without switching my OS. Message 3330 - Posted: 12 Jan 2015, 2:13:37 UTC - in response to Message 3325. Either that or start using VirtualBox. Well, I guess I arrived kind of late. I take it there's no work available, right? I will try and let you guys know before the next model is ready to go. Message 4114 - Posted: 30 Jan 2018, 19:56:04 UTC - in response to Message 4113. Oh, good. I thought it was something I said. If you're going to be driven crazy it might as well be in a limo. There seems to be another slowdown. Not to be pushy, just curious. Yes this project is still active. The modelers who submit to this project are sometimes in different phases of research that don't require a model to be run. We did however have 3 smaller jobs run through the system this weekend. There will be more work hopefully in the near future. Message 4130 - Posted: 4 May 2018, 13:55:41 UTC - in response to Message 4129. So, I will let one host stand-by. Message 4153 - Posted: 7 Sep 2018, 16:10:14 UTC - in response to Message 4129. I haven't been able to access this project for months. Is it still operational?